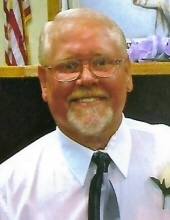 Michael Hansford Penick of Greensburg, Kentucky, son of Charles Penick of Greensburg and Linda Sue Hudgins Shofner of Summersville, was born on Wednesday, January 18, 1961 in Adair County, Kentucky and departed this life on Sunday, April 7, 2019 at his home. He was 58 years, 2 months, and 20 days of age. He had made a profession of faith in Christ and was a member of South Summersville Baptist Church. He was also a veteran, having served in the United States Navy. Besides his parents, Michael is survived by his step-father: Mike Shofner of Summersville; two sisters and brothers-in-law: Debbie and Tony Evans of Summersville, and Jamie and Neal Huffman of Greensburg; a brother: Charles Eric Penick of Nashville; a granddaughter: Devyn Caulk of Campbellsville; his fiancé: Debra Durrett of Greensburg; and a host of other relatives and friends. Mr. Penick was preceded in death by a son: Michael Kyle Penick on September 19, 2018; and his step-mother: Jewell Penick on July 25, 2015. The funeral services for Michael Hansford Penick will be conducted at 11:00 A.M., Central Time, Thursday, April 11, 2019 at the Cowherd and Parrott Funeral Home with burial to follow in the Bethlehem Cemetery. Bro. Jerry Judd and Bro. Leslie Jewell officiating. To plant a tree in memory of Michael Hansford Penick, please visit our Tribute Store. "Email Address" would like to share the life celebration of Michael Hansford Penick. Click on the "link" to go to share a favorite memory or leave a condolence message for the family.